Fagor and Heidenhain manufacture a wide range of encoders and scales. A range of resolutions and signal types with various connectors. Whether you are fitting to a new system or replacing an existing encoder/scale contact us for a price and delivery comparison. We can match other manufacturers scales and encoders on replacement. We specialise in Sprint Electric DC drives for new and replacement applications Analogue and Digital Versions available with a wide power rating. A Small footprint and modern technology allows easy retrofitting. Numerous functions allow for any application and the new digital drive has an LCD screen for fault diagnostics and status display. Price competitive against repair of old drives and a full warranty is included. 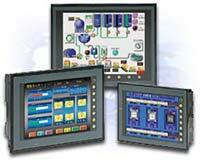 We also specialise in non-cnc control systems and standardise in Siemens touchscreens and PLC systems. Other manufacturers can also be incorporated into systems.